Discover new conclusions about King Hezekiah, royal theology, and the First Isaiah Traditions. Seitz explores the concern surrounding Zion's destiny in ancient Israel, and why Isaiah's prophecies had such an impact on later periods. Challenge yourself, and expand your knowledge of one of the most beloved and important books of the Bible. Contents: Two independent Isaiahs -- "Former things" : the scope and rationale if proto-Isaiah -- No escape for a blasphemer (Isaiah 36-37) -- The destiny of Zion (701 and 587 B.C.E.) 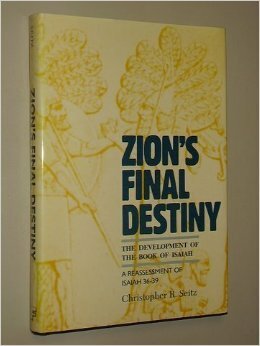 -- Zion-king: death sentence diverted (Isaiah 38) -- The Hezekiah-Isaiah narratives and the growth of the book of Isaiah..228 pages, hardcover from Fortress,by Christopher R. Seitz.